Cleaning the bath’s not something most of us look forward to. 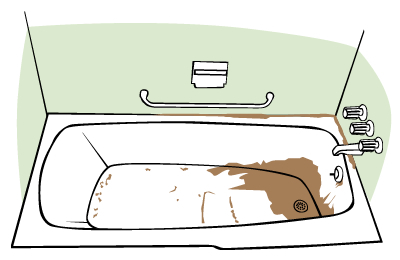 Having said that, there’s no reason that cleaning a bathtub has to take very long or get particularly messy. Most modern baths are coated with stain resistant surfaces, which mean that if they’re cleaned on a weekly basis you shouldn’t have to spend more than ten minutes cleaning the tub. Make sure that you have decent ventilation before you start. Open a window, or switch on the exhaust fan to get some air circulating. It’s best to do the cleaning straight after the bath has been used, as the steam and hot water will have loosened up any residue. Use a soft, damp cloth and a non-abrasive liquid soap – preferably one that’s designed for the purpose. If you have sensitive hands, you might also want to consider wearing rubber gloves. Apply a small amount of liquid soap as directed on the bottle, and start scrubbing it in using the cloth. Begin at the top edge of the tub and work your way down, moving around the walls of the tub. Once that’s done, continue to scrub the floor of the tub. Rinse the entire tub with warm water once you’re finished, and use a towel to dry it down. You can use the above methods to clean out the interior of a Jacuzzi too, but you’ll also need to clean the jets. To do this, fill the bath with hot water until it’s just covering the jets. Add about half a cup of dishwasher powder and around the same amount of bleach. The dishwasher powder is a low-suds soap, so it won’t cause any foaming problems. Mix the powder in thoroughly, then run the Jacuzzi for about fifteen minutes. Drain the bath, fill it with cold water and then repeat to rinse out the cleaning solution.